Summer 1967 was a magical time in music. The news was full of hippies in San Francisco, and at home suddenly everything seemed more colourful. Men let their hair grow out a little; there was sense of freedom in the air. Ties grew wider - the famous kipper tie - and, most importantly, music became more experimental. You couldn't avoid the hippies in the charts. American singer-songwriter Scott McKenzie hit the top (and appeared on Top of the Pops) with San Francisco (Wear Some Flowers In Your Hair), while the home grown Flowerpot Men crooned Let's Go To San Francisco. The idea of hippie music had a huge effect on pop music. It became more dreamy, more psychedelic, taking ideas from rock to shade its arrangements and lyrics. Even some of the new, hip bands, like Traffic, scored, with the evocative Hole In My Shoe. It was the start of the charts becoming more open and accepting of different styles, part of the new Zeitgeist. 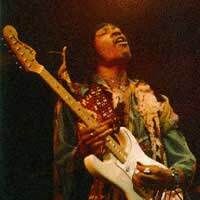 To many, Jimi Hendrix epitomised the new hippie ideal. A wild, unprecedented guitar player, he immediately became the guitar god, admired by other musicians, releasing stunning albums, but with material that could hit the charts as singles. Dressed in loud peacock colours, he was an American visitation, a hippie ideal, making everyone in music re-think whatever they knew. Suddenly, it seemed, there were no boundaries. This was the year when musicians looked at themselves and decided they needed a new direction. To get it they went "to get themselves together in the country," experimenting relentlessly to find fresh sounds, the stranger the better. In some cases it worked, as with Traffic or the Incredible String Band, who emerged from nowhere, in others it flopped spectacularly. In imitation of the big American festivals, there was a 14-hour extravaganza at Alexandra Palace, with many bands entertaining and a light show playing over the crowd. On Tottenham Court Road in London, the UFO Club opened, offering a venue to the new psychedelic bands where they could find an audience - and a record deal, which was still the prime object. The music many made had vast ambition, like Pink Floyd's Interstellar Overdrive or Tomorrow's My White Bicycle. Even a chart topper like Keith West's Excerpt From A Teenage Opera seemed to usher in a new age in pop music. But nothing could compete with Sergeant Pepper's Lonely Hearts Club Band, the new album from the Beatles. Arriving in June, it divided music into what had gone before and what came after. With their Apple label, the band themselves had hardly been immune to the hippie influence (George Harrison had flown to San Francisco to view the phenomenon first hand), and it seemed the archetypal hippie album, experimental, disorienting, hopeful, nostalgic, yet looking firmly to the future. It was truly like nothing that had gone before, the result of months of work, and it put everything else in the shade, a new influence on hundreds of bands who found doorways they'd never even imagined to make their own experiments. It remains one of the most important rock albums for that reason. Even by their dramatic standards, it was a giant leap, a loose concept, but still using the familiar framework of songs. The Beatles, everyone said, had created a masterpiece. They were right. The new rockers were better schooled than the generation that had preceded them, with grander ideas and the ability to achieve them. New groups formed with alarming abandon - The Nice, featuring wild, elaborate keyboard work from Keith Emerson, Cream, which combined three giant talents from the blues scene to make new music, Soft Machine, whose roots lay in jazz, and many, many others. Suddenly the world of rock, which had seemed so constructing even a year before, was wide open.